Recently in the British news, in between snap elections and increased tensions in North Korea, there has been coverage of Prince Harry and William’s admirable openness about their mental health and drive to increase awareness about this important issue. It is totally understandable that given the sudden death of their mother in 1997, that this would have a profound impact on one’s mental health, especially given the exposure in the public eye too. Mental health problems aren’t rare; they affect 1 in 4 of UK population with no single cause. While there is variation by socioeconomic position and genetic predisposition, illnesses like depression and anxiety can impact any background, even those of relatively privileged upbringing. One shouldn’t underestimate the impact that mental health has; disregarding the causation of severe depression in suicides, depression has been scientifically proven to cause heart problems and shorten life expectancy. Talking to others, medication, talking and cognitive behavioral therapies have been shown to help, but there is no ‘golden’ bullet. Awareness of this health issue has generally increased in the ‘developed’ world, but it is still a ‘hidden’ illness and often underfunded area of medicine relative to others. 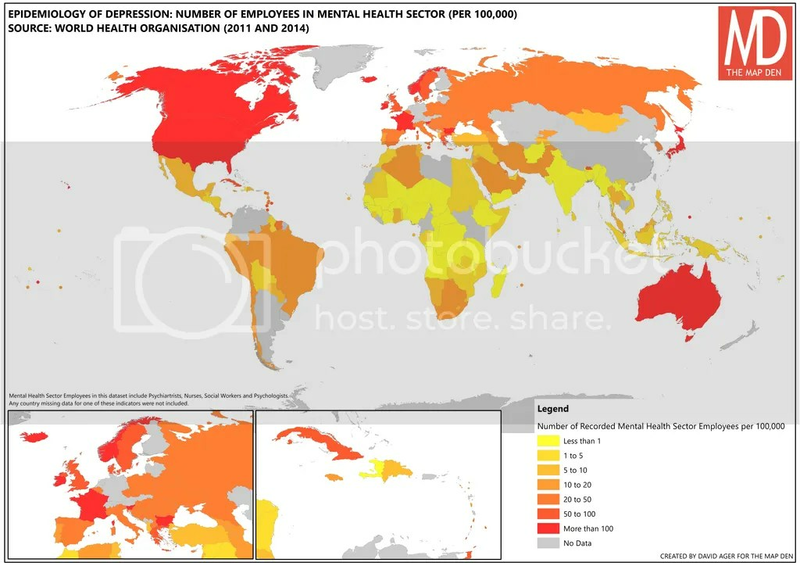 This is a mapping blog however, and what interests me is the possible variation and geographical patterns in rates, attitudes and impacts of mental health issues, using unipolar (not bipolar) depression as an example. Data on mental health is not easy to source, relative to other health conditions, given it’s non-physical, low reported nature and the stigma in many cultures of discussing or recognising illnesses like depression. However, geographical information can still provide insight regarding this – whether this indicates low reporting rates or differing impacts of mental health in different areas. The World Health Organsiation (WHO), records statistics on illnesses not in mortality, but in Disability-adjusted Life Year rates (DALY) (further explanation here). In plain English, this measures the ‘disease burden’, with the years of quality of life impacted by illness, and years lost compared to average life expectancy. One DALY can be thought of as one lost year of “healthy” life. This is a fairer analysis of the life impact of depression, and with regards to impact on a nation’s life expectancy, and is what I have used for this work. In the map above, we can see that the DALY rate of depression has a general noticeable geographical pattern – a higher impact in areas of higher Gross Domestic Product (e.g. this map). 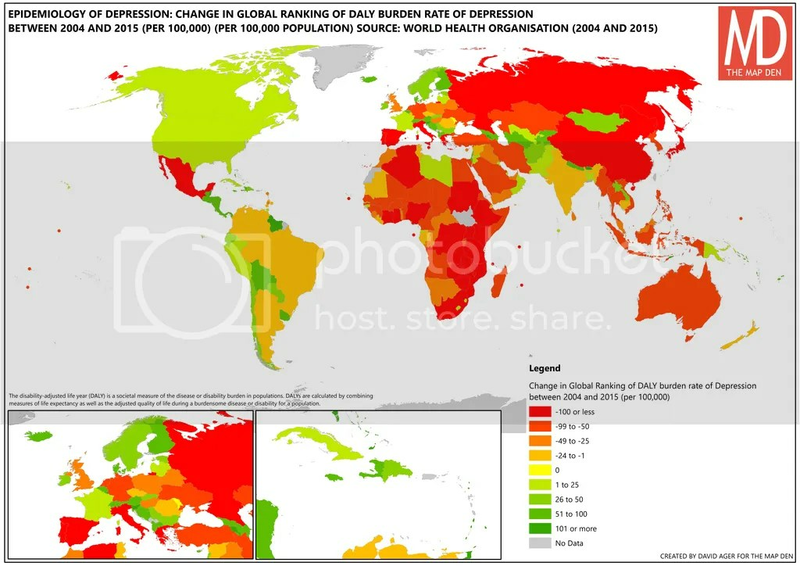 So does this mean depression is a disease of ‘economically developed’ countries? Maybe, but maybe not. I’m not a professional mental health epidemiologist, but I would suggest that there is a reasonable chance depression has the potential to occur in ‘developing’ countries too, however recording rates may differ. Additionally, this is a measure of lifetime burden and impact on life, relative to life expectancy too. Generally, life expectancy is lower in less economically developed countries, but is also less likely to be as impacting on life, relative to other diseases. 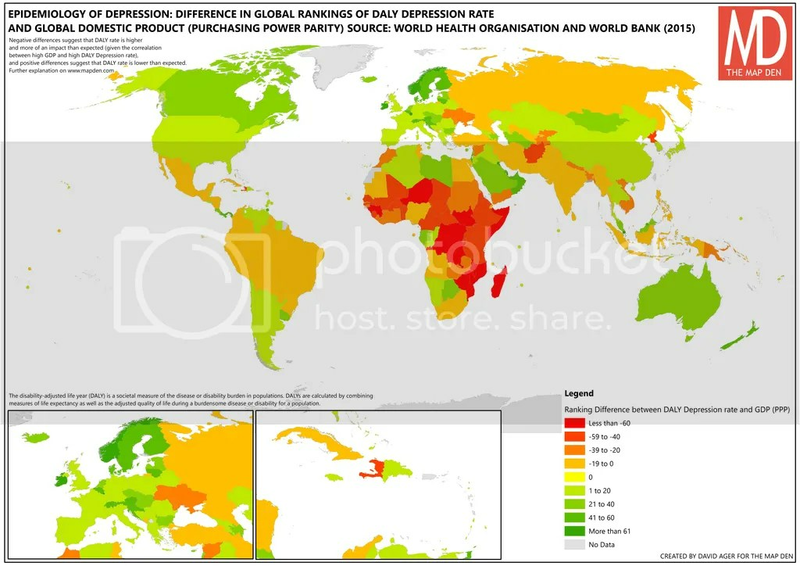 Furthermore, there are exceptions, there are countries like Pakistan and Ethiopia with relatively low GDP (Purchasing Power Parity (PPP)) with higher DALY rates of depression; conversely there are countries like Norway and Canada with relatively high GDP (PPP) and lower DALY rates of depression. Nonetheless, some may point to a general societal focus on the ‘individual’ and work, away from the ‘community’ and society, in the developing world, becoming isolating and impersonal. As well as a potentially greater diagnosis of mental health issues, there does appear a correlation between high DALY rates and high GDP (PPP). Assuming this pattern exists, regardless of cause, it would be interesting to compare rankings of DALY rates and GDP (PPP). The map above compares DALY ranking and GDP (PPP) ranking, and according to this hypothesis there should be little/no difference given theorised GDP/ DALY rate Depression correlation. However, negative differences suggest that DALY rate is higher and more of an impact than expected, and positive differences suggest that DALY rate is lower than expected. 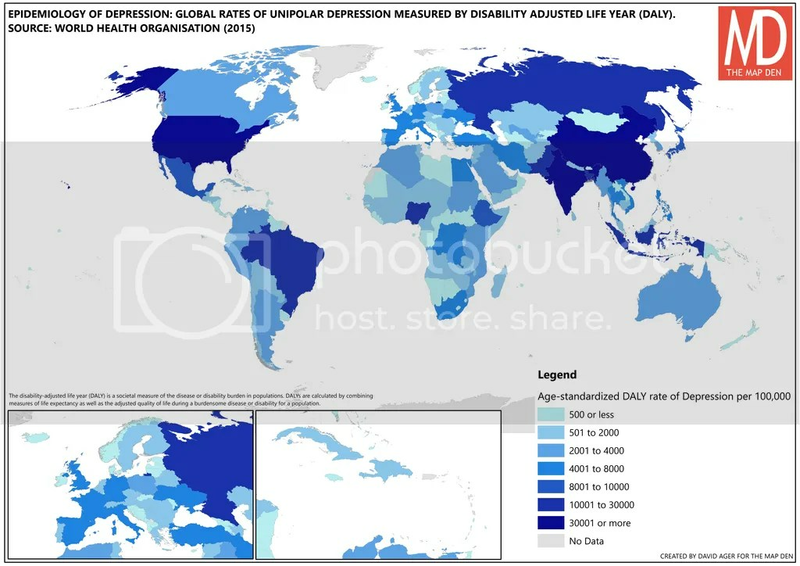 This analysis provides further insight – we can see than Canada, Scandinavia, UAE and New Zealand have a lower than expected DALY Depression rate. 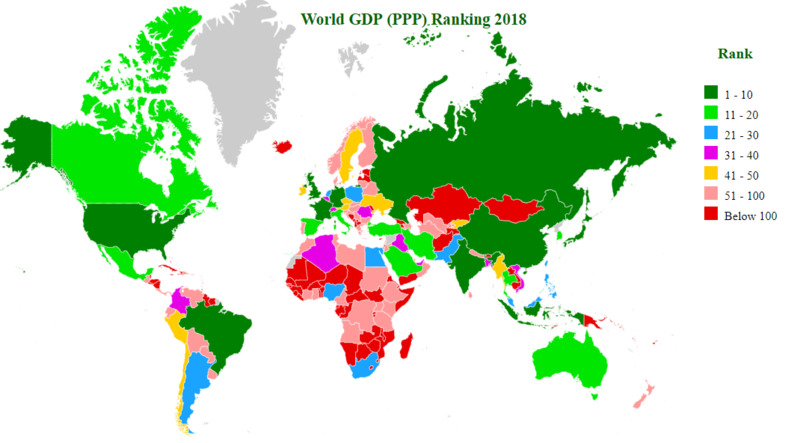 Meanwhile, Russia (which has a high suicide rate), India and Brazil are particularly interesting examples, as they have higher than expected DALY depression rates despite relatively high GDP (PPP) performance. Particularly useful is the extra dimension we get to DALY Depression rates in Africa, where many sub-African countries like DR Congo and South Sudan, while having low DALY rates globally, they are higher than one would expect. This analysis is somewhat crude, but is an interesting examination of the geographical story and relationship between economic and mental health. The preparedness of countries for mental health care provision, bearing in mind rates of depression, is geographically variable and reflective of developmental levels too (see map below). Depression and associated mental health issues affect many people all over world, in most ways it isn’t a very geographic problem. What differs geographically and socially is our situation, care available and the culture and taboo to talk about these health issues. But unlike many geographical problems which can seem distant, abstract and hard to change; as individuals we can change this. Like exercising to help improve our physical fitness and health, we can help others and ourselves through mental fitness. Easier said than done, but in all our own little way we can help create an environment of understanding and support to our colleagues, friends and family, by listening, asking, caring, opening up ourselves, and respecting and helping others. 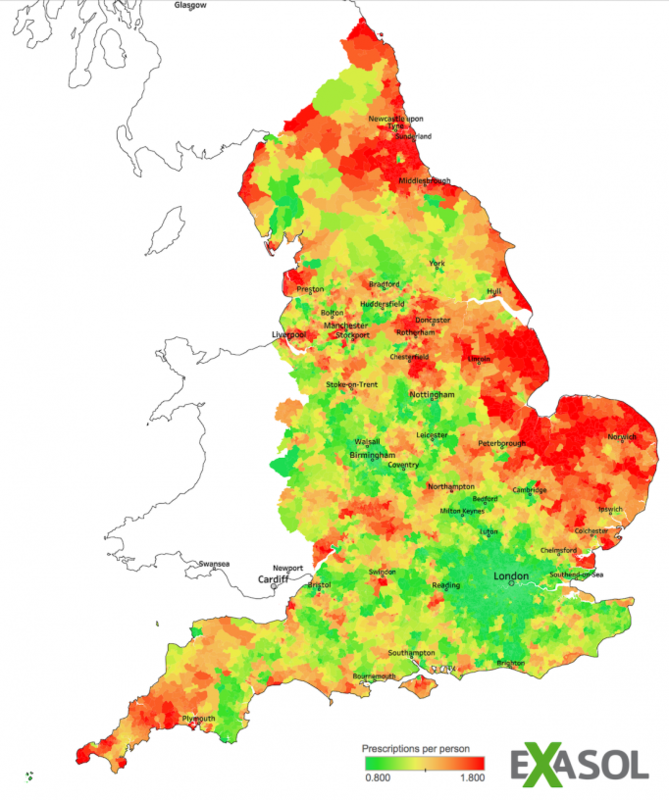 PS: I found this interesting UK map on anti-depressant perscriptions which may reflect urban-rural differences and other geographical trends, for those interested. Previous Post: 07. Map of the Day – You think your commute’s bad?